Singular Architecture is architecture aligned with Nature. Nature is holistic, and holistic environments are fabricated places within which we tell a story. Singular Architecture is an instrumental labyrinth of pathways and intersections. Walking through the labyrinth, the story told is one of resonating harmonic connection. When we breathe life into our architecture, our architecture will breathe life into us. As intervention into artificial environments, it shapes places as medicinal tonics for culture. SA tectonics architecturally engage a continuum of energetic translation between people and place, from the microcosm within our bodies to the macroscope of spiritual space, shifting toward increasing potential energy. Linguistics translates experience, with sensation of touch. Language translates linguistically, when we tell a story, as our sounding words resonate in vibration with another. Sharing stories is a touching experience. Throughout the course of modern civilization languages have continued to change around the world. The singular nature, the quality of translation between different languages, continues to change also. Translation affects the quality of conveyance of ideas. In multiple mediums of expressive language, mediums relating all human senses convey ideals. Languages convey ideological expressions with both logic and emotion, in sensory balance. This balance is embodied within the linguistics of the language and the physiological sensation conveyed. Linguistics shapes the physiological vibration of expression in mediums relating to all our senses. Languages that balance our physiology across multiple mediums are physiolinguistic. Sensory balance in the telling of a story, its physiolinguistic healing nature, is the essence of the Singular Archetype. Physical and perceptual cross connect as physiological experience. Experiences which balance the physical and perceptual realms, are physiological. Healthy interactions can calibrate our somatic cellular fields, in this balance. Linguistic experiences between people, can translate toward a physiological balance as well. Linguistics in the broadest sense, is the physiology of language. This is physiolinguistics. And the success with which a story balances logical and emotional experience, determines its ability to physiologically translate across multiple languages of expression. Physiolinguistic calibration of an experience is healing. A healing experience can happen in the telling of stories. This sensation is a somatic healing experience. Linguistic vibration touches our somatic cellular composition, calibrating our fields. As our languages connect us to others with story telling experience, they have the ability to heal. They can turn empty space into place. The Singular Archetype engages the physiolinguistic story arc, bridging people and place, as resonant healing somatic sensation. Nature takes its course. Global movement outward has perpetuated quantifiable unemotional connections between people, associating communicating connection with a perverted relationship between the private and public. Quantification of artificial human connection is a movement toward chaos, per exponential growth theory. Yet movement toward this chaos can bifurcate, turn to its opposite phase of natural organization, generating qualification. The bifurcation can be abrupt or calibrated. During population migration events, bifurcation shifts occur within nested scales of operational interactive relationships. These shifts are physiological, within a culture. Linguistic communication can facilitate healing transitions within bifurcating populations shifting toward a more localized, emotional spectrum. As cultures conjoin into localized more emotional relationships, chaos can be induced at the personal scale of interaction. This is an effect of the previous desensitization, post globalization of pseudo relations. Chaos is a product of an abrupt bifurcation pattern, versus calibrative. People physiologically forget how to relate emotionally, after experiencing artificial connections. So Nature facilitates calibration, to smooth the transition. Linguistic translation resonates. As our voice resonates, it generates physiolinguistic sensation within and around us. Languages touch people. Yet people are unaccustomed to relating this way after global technological desensitization. So we shift to a more personal, more local and less decentralized way of relating to emotionally reconnect. Local experiences conveyed become less chronologic based, and consequently more personal and emotional. Mediums of language expression then become less informational and more emotional. This can be dangerous, when migratory bifurcating change from global to local cultural growth is abrupt. Graduated bifurcation calibrates the cultural growth, decreasing risk of imbalanced reactionary emotion at the scale of the person and populations. So we evolve. We learn once again, how to relate. We do this with our ability to touch each other, with story telling. Before bipedalism the architecture of the womb was closer to the ground, the spinal column located toward the body anterior, and vertebrate nerve pathways were void of cross connecting decussation. The four footed animal could balance easier than the future bipedal vertebrate. In the vast majority of four footed animal species, females were more frequently physically vulnerable. Then bipedalism evolved. Physiological decussation evolved, in the cross connection of nerve signaling pathways between the upper brain and holistic body. Bipedal evolution was a physiological phenomenon. The intersection of the new map of nerve pathways was related to our vibrating vocal cords. Standing up resulted in a physical devolution for the bipedal vertebrate, yet the female vertebrate established new physiological attributes for protecting herself and growing child within the womb. She established heightened physiolinguistic sensation to compensate for physical vulnerability. She could walk with balance, move nomadically with balance, as her somatosensory experience mapped within and around her. The evolution of the stand, of the vertebrate mammal, was physiological and linguistic. Female members of vertebrate species adapted to protect themselves and future of the species holistically. The evolution of the vertebrate stand was one of balance. The vertebrate was stimulated to stand vertically, to adopt a new physiological relationship to telluric earth. This was an initial point in the evolution of the human. Phase two of the bipedal vertebrate mammal's evolution occurred as a continuation of physiological adaptation. The two footed mammal came to be, the growing child nested in the pelvic butterfly of the womb adaptively pushed the spinal column toward the dorsal side of the body. Then the female sought balance, with child in womb. So she evolved by remapping her communicating nerve pathways. To calibrate the body further, the nerve pathways criss-crossed behind the upper brain and oropharynx. This locus became the vibratory initiation point for the holistic body map, then resonating across our bony inner ear labyrinths calibrating the fluid within. This crossing is known as our body's decussation, stimulating translation between each side of our body. We became balanced, in the stand. She found her voice. She evolved linguistically improving the chances for survival of her species. The vertebrate mammal's chances for survival became the future survival for the human being. Standing tall, the female vertebrate could sound across the fields. Her vibrations would be felt by her commune through the energetic radix of the topography. Across vast atmospheric distances she could convey, with vibrating sound, her need for protection. The standing vertebrate was originally a nomad, as was the human. As a maternal nomad, the female simultaneously sought freedom and safety. She could protect herself and offspring on her own terms with advanced physiolinguistic prowess. To this day the voice of the female touches, like none other on earth. She tells Her story, gifting balance as others listen with vibrating labyrinthine instruments. The Singular Archetype amplifies balance. Its story architecture stimulates a sense of touch with healing physiolinguistic translation within the story arc, balancing logic and emotion. Healing translations across mediums of sensory conveyance, across multiple languages of expression, calibrate in many cultural verses. We exist in a multiverse. It resonates with linguistic vibrating translations between people and place. It resonates with touch. It stimulates a sense of presence while simultaneously generating an aerial view of our surroundings. It connects the story of the human experience, at all scales. Singular Architecture transcends scale, from the smallest particles within our cells, to the child in the womb, to our surrounding environments near and far. It supports physiolinguistic translation at all scales of our telluric story on earth and beyond. Our environments are interconnected and intersected. So internested is the healing relationship between them. Singular Archetype story telling is an architectonic medicinal for humanity. When we are birthed from our mother's womb, our first expression is our voice. We sound, as we cry our first breath. As we express with voice, we vibrate. 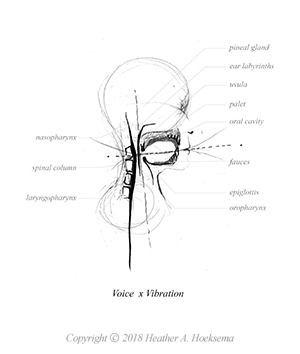 These vibrating translations within our body initially intersect behind our oropharynx, cascade throughout our nerve pathways in signaling conveyance, physiolinguistically moving in a continuum from one somatic cell to the next. Our expression is a physiological experience, stimulated by linguistic vibration, balancing logic and emotion. Our vibrating vocal stand is our ultimate source of balance. 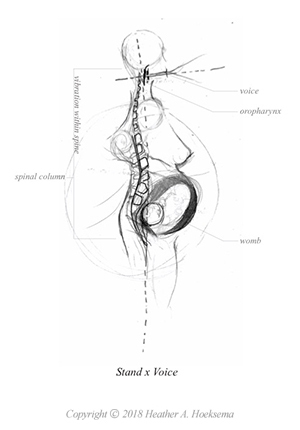 We exit the womb, with physiolinguistic resonance. This evolutionary relationship between the singular architecture of our mother's vocal cords and that of the womb, still exists as our feet touch the ground. Energy cascades down our spinal column, meeting the butterfly within our spinal cord where our second decussation point calibrates our somatosensation of touch. Our vibrating voice is our singular architecture, the origin of the touching Singular Archetype story. 'Singular Archetype' in current shape is the Prelude to the Second Edition of 'Flash Light: 9 Girls' Stories for Grown Ups'. Singular Archetype outlines the logic of the evolution of the female as the initial point of the evolution of human kind. 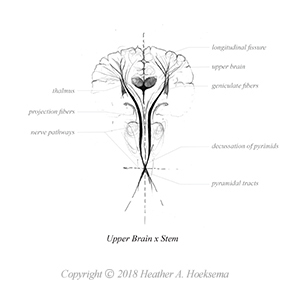 It establish the premise and science, with anatomical drawings, to support this ideology in relation to the linguistics and physiology of healing human connection. 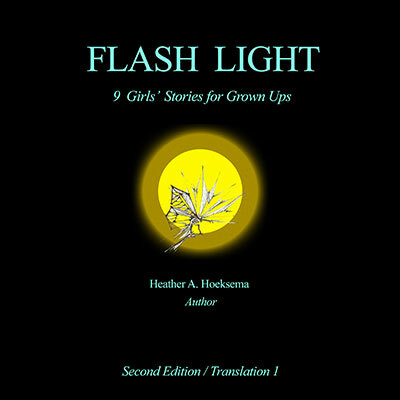 The Second Edition of 'Flash Light: 9 Girls' Stories for Grown Ups' is published and available for delivery. Please contact HHeal Lab/ Singular Architecture Bookings at HH@HHEAL.com for talks/book signings.